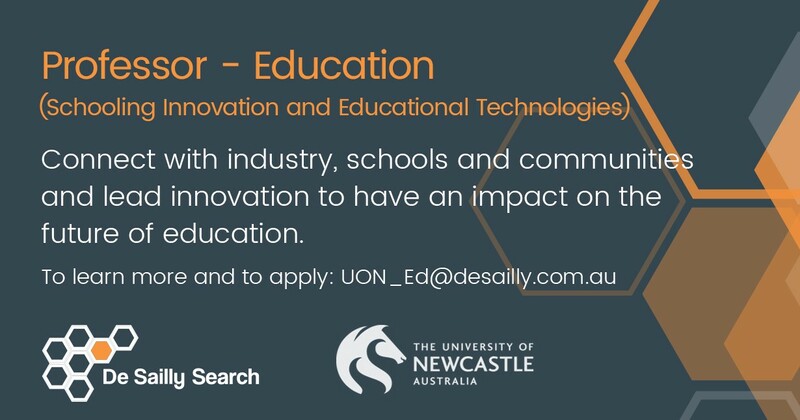 The University of Newcastle School of Education is seeking a leader, scholar and innovative educator who is at the forefront of reimagining learning, teaching and schooling. The evolution of emerging technologies and new school designs challenge us to reframe education for the future, centred on inspired, engaged, personalised and impactful learning. The University is recognised as leading the way in the higher education sector for teacher education, and for excellence and equity. The University is fully committed to finding new ways to unlock the potential of the next generation, through innovation and creative uses of technology to drive learning. The University’s NeW Futures Strategic Plan 2016-2025 continues that commitment with a strong focus on driving global and regional impact. The Professor – Education will play a key role in achieving these goals in research and innovations that have impact across schools. The position will provide academic leadership in developing an evidence base for the impact of innovations and educational technology in school education, and drive the adoption of innovation in classrooms. Working in collaboration with regulators and schooling communities, both locally and with international reach, the Professor will shape directions, and capability in education, research and engagement. This appointment offers a platform for unlocking the potential of innovation in schooling and in educational technologies, developing an academic strategy for teacher education, capacity development and research, that will engage teachers and learners in the classroom, and create beacons for innovative schooling practices that can be adopted at scale. As our ideal candidate, you bring extensive academic expertise, together with practitioner knowledge and networks. You are a recognised leader creating impact in the field of schooling innovation and emerging educational technology. If this describes you – and you are excited by the opportunity to help schools adopt practical solutions in a global vision for the future of teaching and learning – this could be your new. In no more than two pages, provide an overview of your interest in the position and an insight into what you would hope to achieve in the role. In no more than five pages, systematically and individually address the nine Selection Criteria contained in the Position Description. Nominate 3-5 referees with full contact details. With prior consent your referees may be contacted after the interviews.